Physicians Rebecca Neustein and Phoebe Lenhart and orthoptist Marla Shainberg with glasses donated to the ReSpectacle program. To learn more about ReSpectacle, visit www.respectacle.org. To donate eyeglasses to the Emory ReSpectacle chapter or learn about drop-off locations, call 404-778-2928. Glasses for adults and children may also be donated at the pediatric ophthalmology clinic, Clinic B, 5th floor. Imagine being in desperate need of eyeglasses to handle even the simplest of tasks but not having the resources to get those glasses. Then imagine a program that provides prescription glasses — for free — to people who might not be able to get them otherwise. That was the scenario Rebecca Neustein (an Emory medical student at the time) encountered when she visited a friend at Duke Eye Center in 2015. Neustein’s friend and some other students had gotten involved with ReSpectacle, a nonprofit program that collects prescription eyewear and then uses the internet and local ReSpectacle chapters to distribute the glasses to people in underserved communities. Neustein returned to Emory, ready to spread the word about ReSpectacle and gauge interest in starting a chapter. She found support in pediatric ophthalmologist Phoebe Lenhart, MD, and orthoptist Marla Shainberg. Since that time, medical students in the Emory Ophthalmology Interest Group (OIG) have organized a local chapter and started making differences in people’s lives. 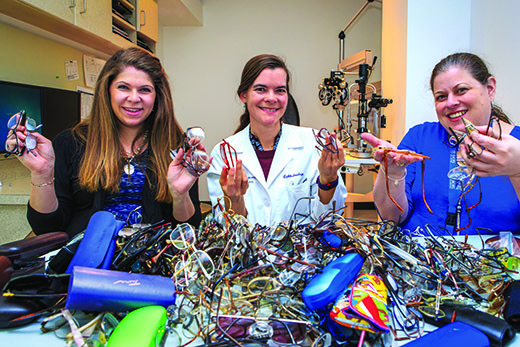 Members of the Emory ReSpectacle chapter meet every two months to clean and inventory the donated eyeglasses. They then log the details about each pair and upload the information to the ReSpectacle website: the prescription, frame color, size and condition of the lenses and frame. More than 300 pairs of eyeglasses have been processed and entered into the database by the Emory chapter. Approximately 100 more pairs have been donated, but the group is always looking for more. One reason for this is that pediatric patients need new glasses more often. And many young families might not have the financial resources to pay for the frequent glasses changes required by their children, Lenhart says. Knowing about ReSpectacle can help parents prevent vision loss in their own children as well as help others. So far, the Emory ReSpectacle chapter has mailed nearly 150 pairs of eyeglasses to patients who found a match through the website. They’ve also helped patients connect with ReSpectacle and get the glasses they need through community vision screenings and clinic appointments at Grady Memorial Hospital.